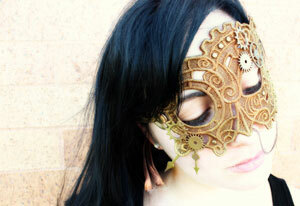 I was doing some Pinterest trawling for inspiration for a Steampunk mask and I ran across a tutorial for a beautiful Venetian-style lace mask at http://www.UrbanThreads.com (pictured above). I don’t have the equipment to machine stitch the lace myself, but I started to poke around the site and found a plethora of hand-stitchable design packs for as little as $4. You can check out the whole sets of hand-stitching designs here and machine-stitching designs here. 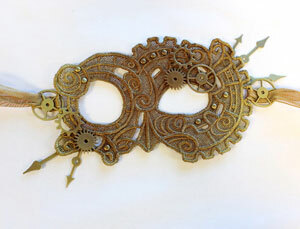 There are a variety of tutorials for DIY Steampunk on the site, many of which could be adapted for the non-embroiderer. Here are pics of some of my favorites, but you can find all of their tutorials here. This entry was posted on December 12, 2013 by Phoebe Darqueling. It was filed under Artwork, DIY and Crafts, Home Decor and Accessories, Steampunk You Can Wear and was tagged with Craft, DIY, DIY steampunk, Do it yourself, Embroidery, Lace, steam punk, Steampunk, steampunk blog, steampunk crafts, Urban Threads. Thanks! That is a very comprehensive list of resources. I have been going “down the rabbit” hole of clicking on the links all morning.